Download this document for printingWhen we lead full, busy, even hectic lives we can easily neglect how our body is coping with all that busy-ness. Our mind is constantly working out the next move – the next best solution in our external world – forgetting that it is our body that will get us there and do the work. So… time for a change! It’s time to pay attention to your body and you will notice the benefits! This routine can take as little as three minutes and can be repeated two, three or even four times to achieve greater relaxation effects. Excellent value, total relaxation in only 12 minutes! It costs nothing. Sit down in a comfortable chair and notice how your body feels. Say “hi” to yourself. Notice your breathing. Begin to slow down your in-breaths and out-breaths. Notice your chest rise and expand with the in-breath and your shoulders and chest drop with the out-breath. 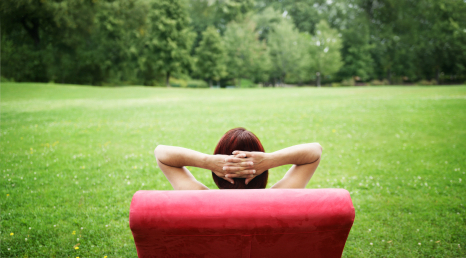 Notice how you are sitting; ask yourself – am I comfortable? Or – can I adjust something to become more comfortable? Do it now. Now you are going to make your mind connect with each part of your body, from your toes to the top of your head, just by taking time to focus on each part. So, beginning with your toes, just notice them. Are they clenched? Can you relax them further? If so, do. Then notice your ankles and repeat the same questions. Become aware and release the muscle tension where you find it. Move up the body through your lower legs, knees, upper legs and buttocks, abdomen, diaphragm and chest, shoulders, arms, wrists, hands and fingers, neck, head, scalp and face. Notice your breathing again and slow it down. Try breathing in through your nose and out gently through your mouth, as if blowing out a candle. Notice your diaphragm expanding and contracting with each breath. Now make these mind-body connections again flowing from the top of your head back down to your toes. Just by drawing your thoughts to each part in sequence. Notice that this is YOUR body. This is the body that gets you around! You rely on it, so it’s good to pay it attention and notice if it needs anything. Ask yourself, is my body telling me something? For example, you may be holding onto some stress. By connecting with your body you can notice and begin to let go of the stress and tensions held in your muscles. As with all physical techniques you need actually to DO it to experience the benefits!